Osteoarthritis (O.A) of the knee can be a painful condition. Most often the medial side (inside) of the knee is affected. 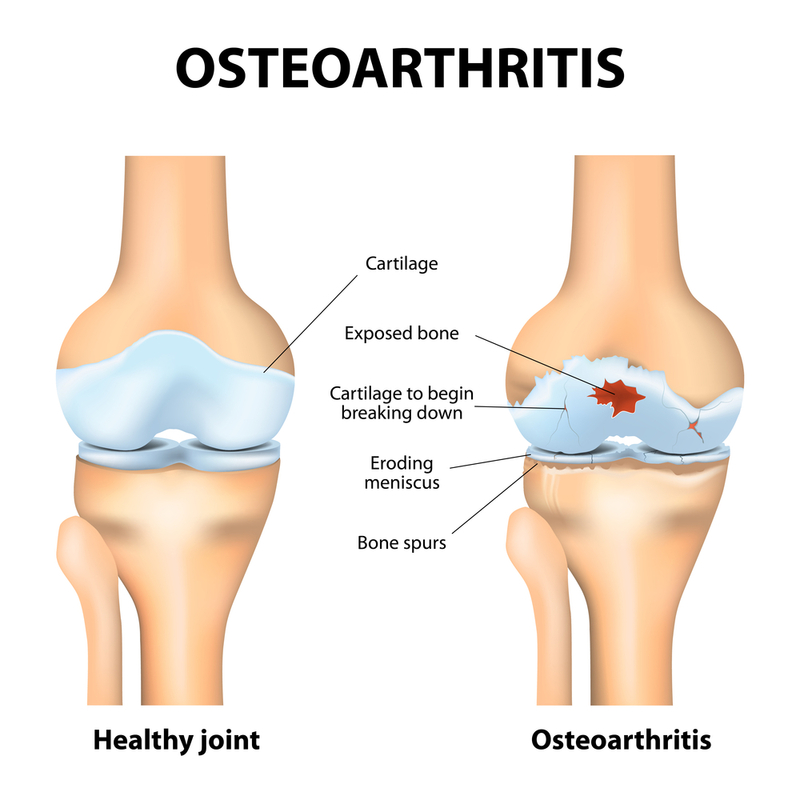 Osteoarthritis is basically 'wear and tear' of the joint. We grade O.A changes from 1-4. Grade 1 are minor changes and grade 4 are severe changes. Although x-ray changes don't always correlate to patients symptoms, I have met people with grade 4 changes that have very little pain. Some people will have reduced range of movement at the knee, which will cause more pain. Pain and reduced movement will cause weakness of the knee. It is important to keep your knee joint as mobile as possible, so keep moving it! It is just as important, if not more so, to maintain knee extension, so don't focus more on the bend. Make sure you work at straightening the knee too. You may need to see a physiotherapist to regain movement if you have lost a significant amount of movement. It is important you consider the whole lower limb from the pelvis down to ensure you get the best relief from an arthritic knee. One of the reasons your knee hurts might be because of a weakness around the hip and pelvis. Our rehabilitation workouts will help you get the best outcome to look after your knees. These workouts will strengthen the whole lower limb chain of muscles as well as improving the flexibility of the lower limb joints. Here are three quad strengthening exercises you can do at home to build the strength around the knee joint. These exercises will reduce pain and improve your knee function. Repeat each exercise 10 times, hold each for 10 seconds, twice per day. If you find 10 second holds and 10 repetitions are too difficult, start with 5 second holds and 5 repetitions and build up to 10. To improve your whole lower limb alignment and strength I suggest you strengthen from the core down. Working your core abdominal muscles, hip and pelvic muscles and lower limb muscles will improve the function of the whole lower limb and prevent symptoms worsening. Try our low impact rehabilitation workouts to build lower limb and core strength.